Facebook offer a social plugin for websites which represent Facebook page of the site and visitors can easily like Facebook page - Facebook Like Box. Facebook Like Box is a popular social plugin you could find on most blogs or websites. It will enable users to like your fan page with a single click while on your blog or website and display how many fans on that particular page. The plugin can be personalized to display faces of existing fans and Facebook page stream too. It is very convenient for visitors who are interested in future updates to subscribe. Would you like to add it for your own site and gain more likes for your Facebook fan page while let them stay connected with your updates? 1. You just need to add this code to your website. Either use XFBML code or HTML5 code as you prefer. Note: The XFBML markup of this plugin may not support earlier versions of Internet Explorer. In order to enhance compatibility with older Internet Explorer versions, add below XML namespace to your root HTML tag. Just specify height of your like box in pixels. Else you can leave it blank and let plugin decide the height automatically. Here you are eligible to select the color scheme of the Facebook like box. Either specify light or dark here as you prefer. You can show off profile pictures of your fans through your like box. Specify true if you would like to display faces, or else specify false here. Specify whether you need border for Like Box. Specify true if you would like to display border, or else specify false here. Specify true if you would like to display stream of your public fan page or else specify false. You can elect to display default header with label 'Find Us on Facebook' here. Either specify true or false as you prefer. Thanks for the tips. I tries implementing the facebook like box and succeed also. But I had one problem. I can see that your facebook fan page url is "http://www.facebook.com/Mayura4Ever" and mine is something like this "http://www.facebook.com/pages/Rozi-Rojgar/298504280180990". How can I make it as http://www.facebook.com/RoziRojgar. 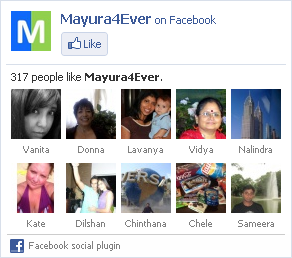 Welcome to Mayura4Ever :) You can find the answer for your query here ~ How to Claim a Username in Facebook. Thank you for this article, now here is the problem that I'm experiencing. When I get the code from facebook I copy it and paste into the add a gadget on my blog is not working. What I'm I doing wrong? I'm new to blogging and really appreciate the info. Very helpful! It should be showing up right underneath the Followers box, but nothing. I just see an empty space with the tools icon next to it (which all it is doing is indicating that there is a widget to edit/modify). Any ideas what I may be doing wrong? I just view your blog via Firefox and Chrome mate :) Works fine with like box. You may try clearing cache or see if there is any extension or add-on blocking it. Your post seems good as I have added a like box to my blogger blog. Now I need to remove its border. Can you please help me? Sorry I have no idea about that mate :) Try Google. You may find a tutorial on that or else you have to hire a developer to make one for your site.